The tour will pick you up from your accommodation in Darwin at 6am. We will make our way to the World Heritage-listed Kakadu National Park, with a stop off at Corroboree Billabong for a wildlife cruise and a chance to spot saltwater crocodiles and plenty of bird-life. We’ll then enter into the Aboriginal lands of Kakadu National Park to explore the Aboriginal paintings at Ubirr and to take in the views across the floodplains which lead to Arnhem land. We’ll then head towards our campsite making a stop at the Bowali visitor centre on the way. 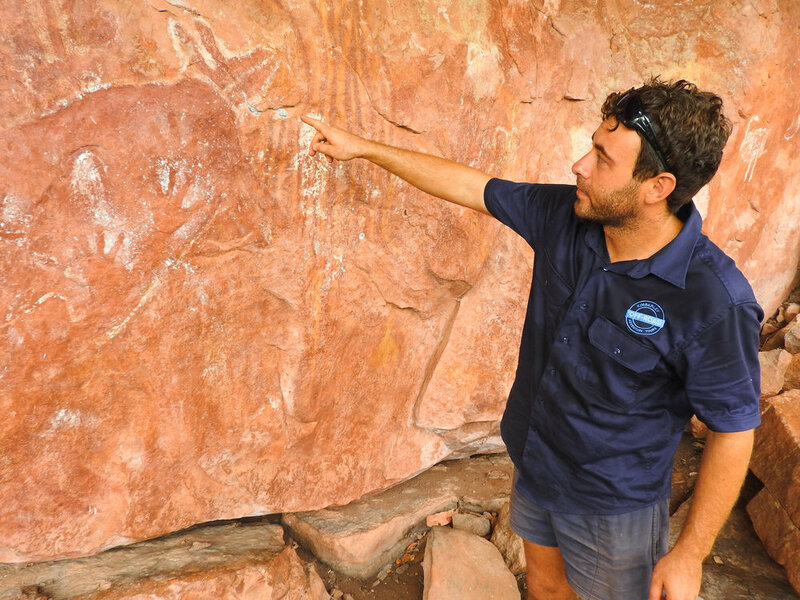 Highlights: Corroboree Billabong cruise, Kakadu National Park and rock art paintings. Our first stop is a morning look at the Yellow Waters wetlands to see some of Kakadu’s 280 bird species. We’ll then make our way to Gunlom Falls where we’ll find a natural infinity pool perched up on the Arnhem land escarpment with stunning views. After lunch we will make a stop in Katherine before visiting Mataranka in Elsey National Park. We’ll stay in the National Park for our night of camping. Highlights: Gunlom Falls and Yellow Water Billabong. This morning you will have the opportunity to swim in the crystal-clear spring waters (either Bitter Springs or Mataranka Hot Springs). We’ll then head east following the Roper River, stopping in at Roper Bar, a river crossing used for access to southern Arnhem Land. Here, we wander through the ruins of a historic police station from the early pioneering days. We then continue on the Savannah Way spotting wildlife around the picturesque Lomarieum Lagoon. We’ll continue our drive crossing many pristine creeks and rivers, making a stop in the Nathan River Ranger Station and Information Centre in Limmen National Park. Tonight, we will make our camp in the National Park. Highlights: Historic Police station and Lomarieum Lagoon. Our first stop this morning is Butterfly Gorge for a morning swim, here there are masses of the Common Crow butterflies. The next stop is the Southern Lost City, where we will take a walk among ancient pillars displaying unique rock formations. We then continue to a true water lover’s paradise known as Lorrella Springs; a massive cattle station of almost a million acres, full of hot springs, waterfalls, billabongs, wild rock formations and Aboriginal paintings. The station is a true hidden gem and we will spend the next two nights camping and exploring the area. Highlights: South Lost City and Lorella Springs. Today is all about adventure and exploring. With almost a thousand kilometres of tracks on the property, we spend the daylight hours exploring Lorrella Springs, visiting swimming holes, Aboriginal sites and viewpoints around the station. Highlights: Lorella Springs Wilderness Park. We continue East, stopping in at a remote outback town called Borroloola. We’ll cross over many pristine rivers and creeks where you’ll see giant ancient cycads growing. We make a stop at the lesser-known Echo Gorge to explore the area. Tonight, we’ll camp near the Northern Territory / Queensland border. We stop at Hells Gates to explore the sandstone formations and discover some Aboriginal sites before crossing over the Nicholson River where you’ll see the giant causeway. We take station trails through one of Queensland’s largest cattle stations, Lawn Hill, to the world heritage listed Riversleigh fossil fields. Here are the fossilised remains of the largest known Freshwater crocodile and gizzard stones of towering flightless birds. W’lle then make our way to Adel’s Grove where there are peaceful clear swimming holes to camp near. We will base ourselves here for the next two nights. Today we spend the day in Boodjamulla (Lawn Hill) National Park which is one of Queensland's most significant geological parks, with interesting rocks and landscapes formed over hundreds of millions of years. Lawn Hill Gorge is surrounded by beautiful red sandstone and a beautiful rainforest; the gorge is filled with clear, cold water from a distant spring, making swimming irresistible. We will visit the upper gorge, Indarri Falls and we’ll complete the Island Stack walk. You’ll have plenty of opportunities to swim throughout the day. Highlights: Boodjamulla (Lawn Hill) National Park including Upper gorge, Indarri Falls and the Island Stack Walk. We make our way to Leichhardt Falls a wide-open set of falls on the Leichhardt River. We’ll then make our way east, stopping in at Camp 119, the last camp on the ill-fated Burke and Wills expedition. We make a stop in Normanton to visit Krys Crocodile, a replica of the largest (8.63 metre) crocodile ever shot. Afterwards we’ll take a swim in Lake Belmore near Croydon, an old gold rush town where we will spend the night. Highlights: Leichhardt Falls, camp 119, Krys Crocodile and Lake Belmore. Today we’ll travel to Georgetown. On route we will stop at Cumberland’s chimney, a remanent from the gold rush days. We’ll also stop at a large waterhole where you’ll have the opportunity to spot local bird-life. We will then continue on to one of Australia’s best Mineral Collections (the Ted Elliott Collection) before moving on to Undara Lava tubes. Here, you will be taken on a 2-hour guided tour of the tubes with a local guide. We will camp at Undara. Highlights: Cumberland's chimney, the Ted Elliott (mineral) Collection and Undara Lava tubes. We head to the Kalkani Crater where you get great views of the surrounding volcanic regions. We’ll then make our way into the tropical rainforest to Millaa Millaa Falls where many tv commercials have been filmed. We’ll move on to Josephine Falls for a swim in the cool waters flowing down from Queensland’s highest mountain known as Mount Bartle Frere. We’ll arrive in Cairns around 3pm. Highlights: Kalkani Crater, Millaa Milaa Falls and Josephine Falls.